T-R PHOTO BY THORN COMPTON • East Marshall senior Seth Kilborn, second from right, signs his letter of intent to attend Indian Hills Community College on a scholarship on Thursday. Kilborn is joined at the table his father Scott Kilborn, left, mother Cari Glackl, second from left, high school coach Trent Taylor, center, and Indian Hills coach Scott Barnes, right. LE GRAND — Though the cross country season ended with the state tournament last weekend, East Marshall senior Seth Kilborn won’t be done racing competitively any time soon. The Mustangs harrier inked a letter of intent on Thursday to run track and cross country for Indian Hills Community College starting next year. After making everything official, Kilborn said it’s a surreal feeling knowing that he will be competing on a collegiate level. While Kilborn may not be large in stature, he is large in voice and heart, something Trent Taylor, his coach at East Marshall, said was a huge factor in Kilborn being a part of four state-qualifying teams. 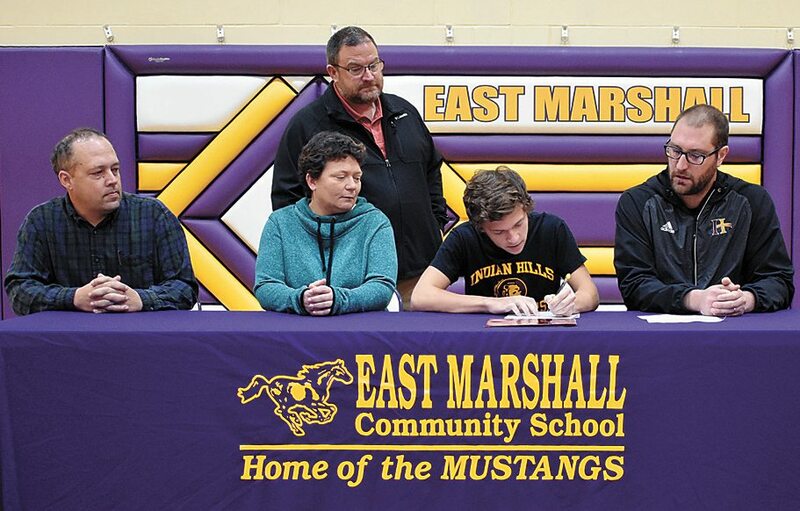 While Mustangs cross country will lose a leader, Warriors cross country will gain one, and Indian Hills head coach Scott Barnes, who was in attendance for the signing on Thursday, said Kilborn will make an immediate impact on the team next season. While of course cross country will be his main focus, Kilborn said he is excited about contributing on the track teams too, especially the indoor track team. Indian Hills has only had track for going on three seasons, but in that short time the Warriors have become a premiere team in the NJCAA. 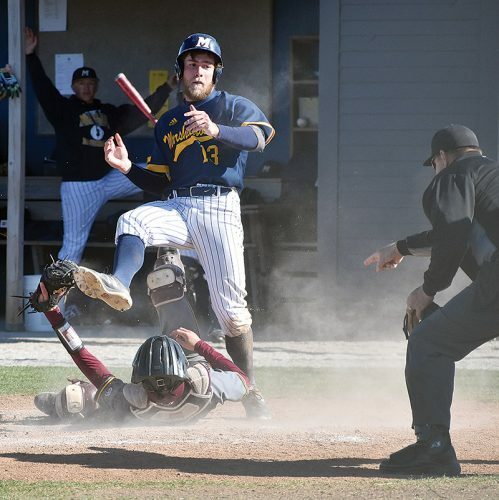 Kilborn said the successful nature of the Indian Hills teams was just one thing that attracted him to the school. Making the transition from high school running to college running is never an easy one, but Taylor said if anyone can make that transition smoothly, it will be Kilborn. 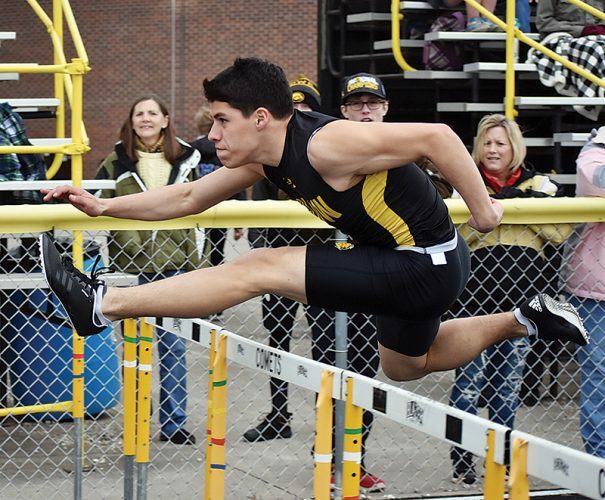 What gives Taylor that confidence in Kilborn’s ability, he said, is knowing the amount of work Kilborn has put into his running even before getting to East Marshall. This signing event has been a long time in the making for Kilborn, and after it was all over he said he hopes his success as a Mustang and ability to continue on to the next level helps inspire younger runners, just as runners like Caleb Benzing and Haley Fye inspired him.